Jim Pryor, Harold Witcher and Coy Squyres in Nicaragua. Angelica Muñoz, at first well location in Nicaragua. 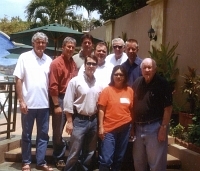 Jim Pryor first became involved in the Nicaraguan project in the mid 1990s when long time friend and business associate Harold Witcher asked him to assist him in matters of geology, government affairs and funding for a project in the newly formed by free elections, nation of Nicaragua. Mr. Witcher had sought oil and gas opportunities in Nicaragua since the early 1970s prior to the devastating earthquake that preceded 17 years of civil unrest. During these years of civil war, Mr. Witcher could not return to Nicaragua. After the election of a free government in Nicaragua, Mr. Witcher and Jim Pryor returned to further the original work started in the 1970s. At this time it was not possible to acquire drilling and production rights in Nicaragua because no laws had yet been passed to authorize the exploitation of oil/gas, considered a national resource. Pryor, Witcher and Muñoz exploring surface geology. While waiting for the passage of a required national hydrocarbon law, Pryor-Witcher initiated geologic and remote sensing studies over areas Mr. Witcher had investigated for oil/gas potential two decades before. In confirmation of Jim Pryor and Harold Witcher's beliefs, the scientific surveys all indicated that the area along the Pacific ocean of western Nicaragua, long favored by the pair as perspective for oil/gas, was indeed likely to contain huge reserves of oil and gas. This area is known as the on-shore portion of the Sandino Basin. 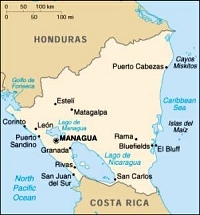 In 2002, Nicaragua passed the long awaited Hydrocarbon law and in 2004, Nicaragua opened the 1st ever round of bidding for exploration rights in the free nation of Nicaragua. The men formed a Nicaraguan Corporation called "Industria Oklahoma/Nicaragua S.A.", and proposed a bid. The Company was awarded the 1st ever concession, in the 1st ever bidding round, in the nation of Nicaragua. The nearly one million acre concession is know as the OKLANICSA Concession. Witcher and Pryor struck a deal with a Canadian Company to drill on the concession. The Canadian Company's 3 test wells confirmed that oil had been generated, migrated and the company's seismic surveys proved the abundant existence of traps in which oil could accumulate in large quantities. This proof of generation, migration, and trapping of oil and gas completes the requirements necessary to prove the existence of oil in Nicaragua for the first time in history. Thanks in major part to the efforts of Harold Witcher and Jim Pryor over many years, Nicaragua is poised to become a major oil producer in Latin America.